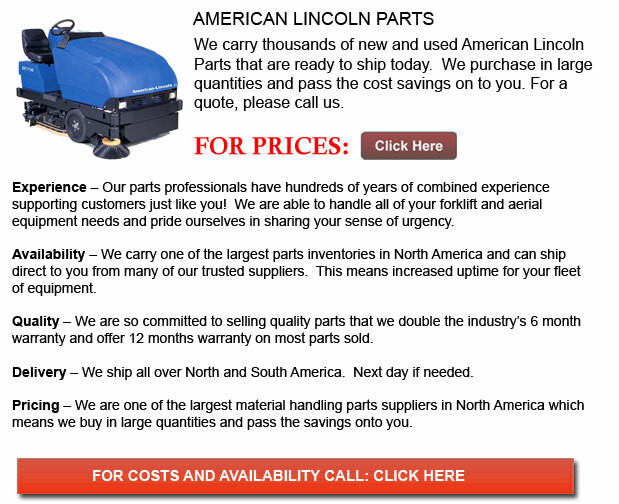 American Lincoln Parts - The American Lincoln division is currently connected with the Nilfisk Advance Industrial Group located in Plymouth, MN, USA. They specialize in floor cleaning equipment which are recognized within the business as durable and strong machinery that satisfies all the needs of larger infrastructure and heavy industry. American made products; the sales are conducted nation- wide through authorized distributors, direct Government sales and national accounts. American Lincoln shares the battery-operated walk behind model of floor scrubber together with the Clarke Company who is now also owned by Nilfsk Advance. Their production operations are primarily based in Springdale Arkansas. These scrubbers are on the market under the brand name "Encore". American Lincoln has the ability to supply machines, components and warranty service for these kinds of scrubbers which carry both the Clarke and Encore logos. Distributed in Wal-Mart and Target distribution centers, the 7765 floor scrubber model is the highest selling floor scrubber in American Lincoln's line and the 7765 has become a trusted model for many facility managers where results and efficiency matter. Lately, this particular floor scrubber model has been used by the architects in various construction jobs like for instance Home Depot's and Lowes Home Improvement Stores. Flooring contractors make use of this particular sweeper scrubber on site because of the model's supreme performance level and excellent quality for polishing concrete.